Location: Chalvignac, in the Cantal departement of France (Auvergne Region). 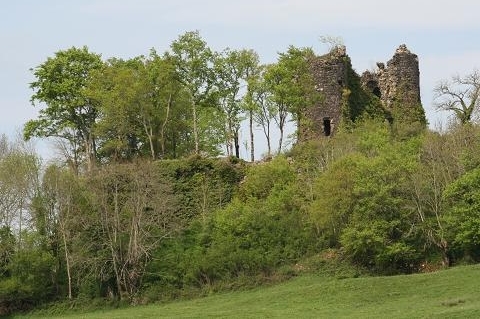 Notes: Château de Miremont, or Miramont, is a ruined castle located in the Cantal Chalvignac. Established near Mauriac, his lordship fell in fief of the lords of Charlus and fief of the bishop of Clermont. It is the subject of a registration as a historic monument since 26 March 1973. It is located 640 meters above sea level on a basalt plateau at the confluence of Labiou and Dordogne. It was forbidden to the east by a masonry wall which closed the spur. At its southern end was the front door surmounted by a square tower. The stables, which were vaulted, were backed into the wall. Then, an empty space was dug a ditch, lined with a cons-scarp, who went to the edge of a basalt base near which was built the castle. One reached the second door by a drawbridge. At noon, the chamber consisted of a very high terrace wall; To the west, the boundary wall formed the salient and re-entrant angles and he relied on the south side to a large tower on the other to that which was used as dungeon and commanding the door. His courses and quite extensive gardens stretched between the castle and the western pregnant.